For the last 25000 years man has been cultivating dagga, using it to clothe themselves, heal the sick, feed the hungry and alter the state of their consciousness. 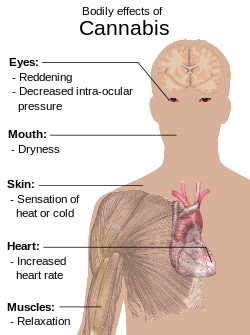 Physiological effects of dagga on the human body. The human body is designed to include a complete cannabinoid system. Cannabinoids that naturally occur inside the body are called Endo Cannabinoids. We have cannabinoid receptors located in our brain, skin and organs. Receptors can almost be found in every part of the body. How dagga is consumed is irrelevant as the end result is the same. The cannabinoids in dagga makes its way into your blood stream, couples with receptors found around the body and even manages to pass the blood brain barrier and couples to CB1 & CB2 receptors in the brain. This coupling of receptors in the brain is what causes the euphoria or high experienced when consuming decarboxylated THC. In order for the THC cannabinoid to couple with the receptors the dagga needs to be heated to convert the THC Acid into THC. Only when dagga is smoked, baked or vaporized does it become active. It is impossible to get high from raw dagga. Humans have been designed to consume dagga. Dagga is a vegetable and is the most important dietary essential on the planet. The consumption of dagga is preventative proven by medical benefits. Did you know? Durban Poison, the well known South African Sativa strain, is one of the favorite medical grade dagga strains in the United States where medical dagga is legal. Dagga does not cause psychosis. People suffering from predisposed mental conditions are at risk of psychosis. However no clerical evidence exists to make this link. My personal opinion is that dagga brings forth underlying mental conditions in people with predisposed mental conditions. Dagga is merely an indicator of an existing mental condition. Did you know? Dagga counters snake venom! You need to be high at the time of bite for it to work. Proving prevention is better than cure. Almost all the negative associations of dagga are attributed to prohibition. Under prohibition dagga is unregulated and open game for crime syndicates, gangs and even otherwise law abiding citizen to exploit for their own benefit. There is no regulation to ensure quality of the product that makes it to the end-user. There is no regulation to protect children and persons with predisposed mental conditions in the current illicit dagga industry. South Africa is poverty stricken but the government corporation keeps throwing millions towards the fight on drug users and peddlers effectively making criminals from otherwise law abiding citizens for profit. If a harsh jail sentence, admission of guilt fine and a criminal record was not already enough the corporate government also funds a special branch in the South African police Air Wing called DaggaOP that routinely spray dagga crops from helicopter with herbicides like glyphosphate with special tanks and spraying equipment sponsored by the United States’ Drug Enforcement Agency. These corporate governments who fund these operation do not care that some of these contaminated dagga plants make its way to the dagga users of South Africa pushed on by desperate growers depending on this easy cash crop to support his family. While dagga is unregulated otherwise law abiding citizen using dagga are exposed to other hard drugs some of the syndicates or gangs might be offering thus the gateway effect is created directly by prohibition allowing criminal syndicates to be in control of dagga. It’s worthy to keep in mind that the majority of dagga dealers are not part of syndicates or gangs. Most dagga dealers are otherwise law abiding citizens whose only means of income is from cultivating or selling dagga. Dagga easily grows on its own essentially has zero cost for production value. Dagga grows from seed to harvest within 8 to 12 weeks* (some strains may take longer to flower) and can be planted in the same soil for up to 20 years. Dagga provides food, oil, alternative green carbon neutral bio-fuel, textile material, stronger building material, medication and much, much more. This wonder plant has over 50 000 uses! What can South Africa achieve with legal dagga? We could speculate at how 50 000 uses of a wonder plant could revolutionise South Africa but let’s take a realistic approach by looking at other countries that have a legalised dagga industry. Seven ways dagga legalisation has already benefited Colorado in only 8 months. According to Uniform Crime Reporting data for Denver, there has been a 10.1% decrease in overall crime from this time last year and a 5.2% drop in violent crime. The state has garnered over 10 million in taxes from retail sales in the first 4 months. The first 40 million of this tax revenue is earmarked for public schools and infrastructure, as well as for youth educational campaigns about substance use. There are renewed efforts to study the medical efficacy of dagga within the state, making Colorado an epicenter for dagga research. The dagga industry has developed quickly, generating thousands of new jobs. It is estimated there are currently about 10,000 people directly involved with this industry, with 1,000 to 2,000 gaining employment in the past few months alone. Colorado Governor John Hickenlooper, who opposed Amendment 64, recently compared Colorado’s economy since legalization to that of other states by noting, “While the rest of the country’s economy is slowly picking back up, we’re thriving here in Colorado.” For example, the demand for commercial real estate has increased drastically, with houses in the state appreciating up to 8.7 percent in the past year alone. The voters of Colorado retain an overall positive view of the regulated dagga market, with 54% of Colorado voters still supporting dagga legalization and regulation, according to a recent Quinnipiac poll. By removing criminal penalties for certain dagga-related offenses, thousands of individuals will avoid the collateral consequences associated with a criminal record. The state is estimated to potentially save $12-40 million over the span of a year simply by ending arrests for dagga possession. Ignorance has no place in law. The science is clear. Dagga is a safer choice to alcohol and tobacco. It is wrong to make criminals of otherwise law abiding citizens and to deny people their medicine.